Pakistan and the United States have agreed to continue efforts to promote the shared objectives of peace and stability in the region and diversify bilateral relationship. The understanding came at delegation level talks between the two countries in Islamabad on Tuesday. 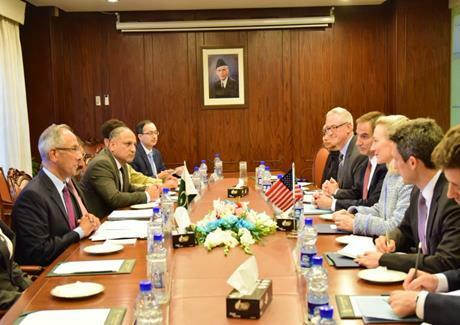 Additional Secretary (Americas) Aftab Khokher led the Pakistan side while the US delegation was headed by US Deputy Assistant Secretary of State Alice Wells. Pakistani side emphasized the need to diversify the relationship with particular focus on enhanced economic and trade cooperation and people to people contacts. The US delegation appreciated the need to strengthen the bilateral relationship with Pakistan which was an important country of the region. The meeting took stock of the understanding reached between Foreign Minister Shah Mehmood Qureshi and US Secretary of State Mike Pompeo to rebuild the relationship based on mutual trust and respect. Evolving regional situation and peace and stability in Afghanistan were also discussed.